The House of Sentiments is located at the interface of virtual and object-related space. 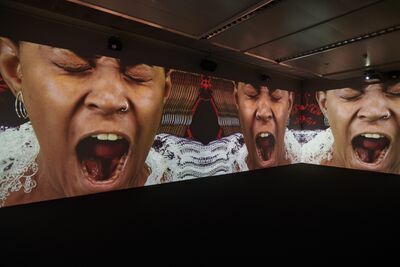 It is a multimedia installation that thematizes the digital penetration of today's world in a multi-layered way. 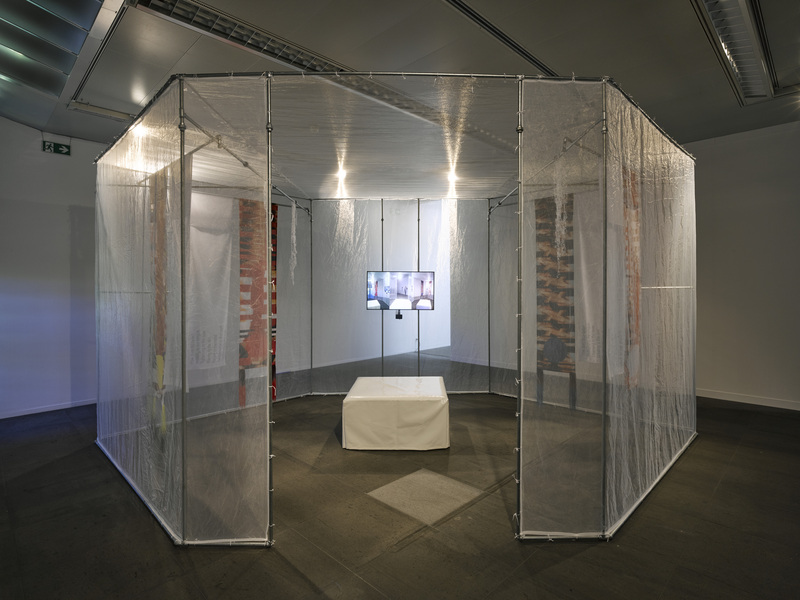 House of Sentiments consists of a multi-part video installation and a walk-in sculpture. In an atmospheric installation, visitors are confronted with how virtual, architectural and emotional realities mix and influence each other. Building: The video room touches the museum building, uses its architecture and is characterized by its conditions: acoustics, climate, security. Body: A walk-in, interactive sculpture stands as a body free, almost autonomous in space. Khensani de Klerk (Matri-Archi) performing four different emotions for "House of Sentiments"
HR: The central piece of “House of Sentiments” is a video. Could you tell me about its narration? U5: There is no narration, no beginning or end. The video runs in a loop. It has highlights and moments to take a breath. The film carries the viewer through these moments, like a train of thought in which one thing fits the other and one no longer knows which thought was first and leads to the next. The projection screen is divided into four different pictures / emotions: The Red Room (angry), The Yellow Room (happy), The Gray Room (calm) and The Blue Room (sad). In this division is leaned on Judy Chicago‘s “All the colours of the year.” In this work she assigned emotions to colours, which we adopted, only the emotion “calm” we changed from purple to grey. Every room has an emotion, a colour, a fragrance, a sound, a symbol, an element. But there are also moments, in which one of these rooms takes on the entire projection surface. The loud emotions, angry and happy, expand on the two frontal projection screens, while the two quiet emotions, sad and calm, flank each to the left and right. Each feeling has its own soundscape while all four mingle in the room to one. 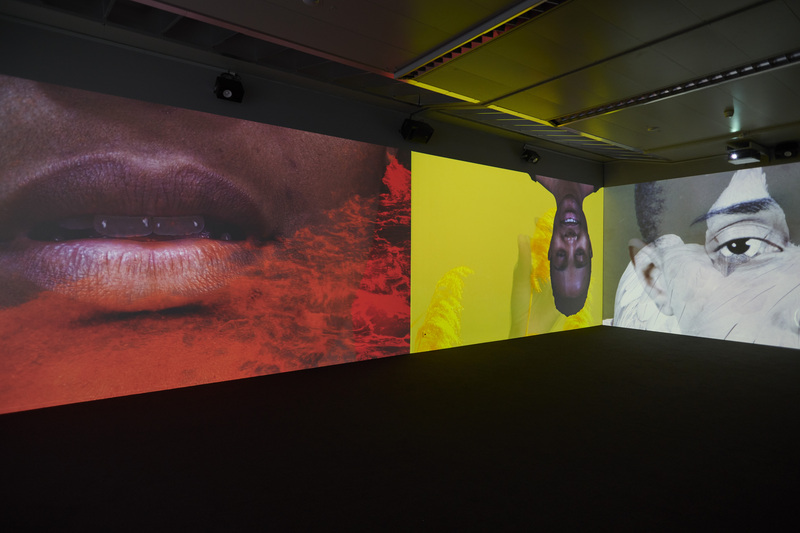 HR: The work seems to merge from a mixture of art historical references, excerpts of existing texts, surveillance footage, studies on colour visions, and ultimately a product of various associations made by the observer. To speak in musical terms, for me it is a challenging assemblage somewhere in between cacophony and euphony of the senses. Did you plan this confusion from the beginning? U5: Yes, because no feeling is pure, it is always a mixture. How a situation affects feelings varies from person to person, based on their experiences. Confusions urge you to feel. Music has the ability to come closest to the emotions, to trigger them the fastest. That‘s why the installation is important. Vivian Wang has joined the voice and sounds to the picture. 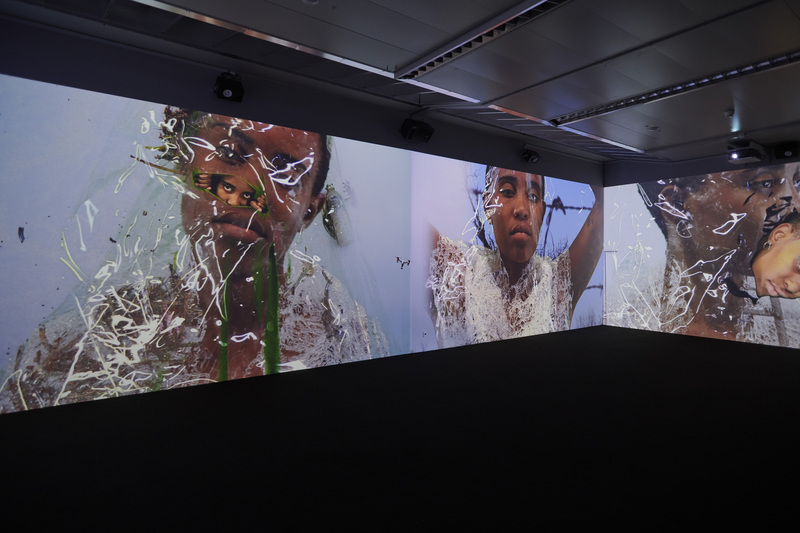 The projection surfaces in the room change constantly––they can become anything. U5: ...Yes, and this behaviour is also controlled by the media. Especially, in the current politics. Adam Smith wrote the theory of emotions before he broke through as an economist. He seemed to come to the conclusion that we make most decisions emotionally, even if they seem strategic and rational. That‘s why capitalism works so well. Emotions are the culprits, not the victims. Fear and greed control the stock market, and add stupidity to the whole world. According to Albert Einstein three great forces rule the world: stupidity, fear and greed. Simultaneously, we have to adapt our behaviour over and over again to the new living conditions. We are particularly interested in dealing with new technologies, with the digital and how they disturb our emotional balance. In the “House of Sentiments,” we influence the visitor by dragging, observing and involving him or her. Vivian Wang: The music-colour association has been researched for eons, although we still haven’t come close to understanding what it is in our complex brain that does this. These connections are why you never see bright yellow or pink featured on the album cover art of a metal band or a dark blue or bloody red on a new age album cover, say Enya––I am not a fan! Colour has collective emotional associations, although this may not be true across cultures. Amongst Europeans, the colour red is associated with danger, passion, excitement or revolution. In Chinese culture, red is entirely emblematic of good luck and happiness. What I find extremely cool is that some people, „chromesthetes“ as they’re known, actually see colour when listening to music. It’s a neural condition I wished I had. HR: Vivian, how do you transform feelings into music? VW: Music and colour have commonly accepted emotional qualities. As humans, we react to colour pretty much in the same way we react to sound. It may seem be nuanced or very dramatic depending on the incoming information and how we respond. Frankly, it’s not surprising that so much of our inner life is triggered by sound as well as colour. The same goes for smell. 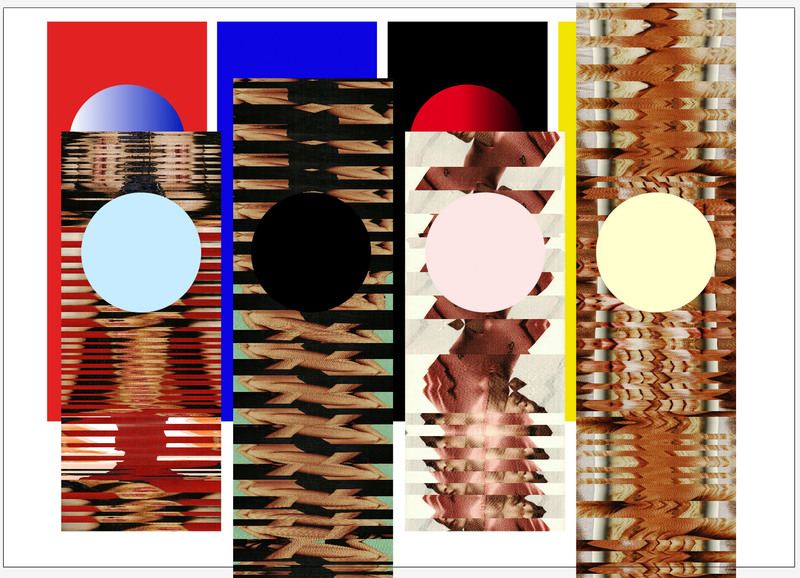 For “House of Sentiments,“ the challenge wasn’t so much how to represent the sound of each colour, but how to present a spectrum of sonic attributes that correlated with a spectrum of emotions. This spectrum can be embracing and even overlapping at times, but in other moments, it narrows and becomes more precise. Besides, I worked on all four visuals separately to create distinction and a more defined tonal character for each. But it all still had to work with the visuals! After all, what’s the point of scoring for visuals if it didn’t create a cinematic language that draws you in? All the same, the biggest challenge was to do this in a way that combines all four sound scores seamlessly and in a way that still worked as a whole without creating cacophony, unless the cacophony was intentional. HR: While creating the installation you also assigned art movements, animals and other elements to colours. Could you share more insights? U5: “Anger” is red. It‘s a loud feeling, pulsating blood, fast rhythm, heat. The element for this is the fire. It smells of smoke, burnt, overflowing, aggressive, intrusive, baroque. The sound is crackling and whipping. As a counterpart there is “calm,” a quiet, gray feeling, without expression, relaxed and neutral. Facial muscles relax, it smells like forest soil and earth, as a symbol we have assigned the sweet potato. It is clear, smooth, balanced, considered, hardly pronounced, minimalism. HR: During our last conversation you mentioned the idea of a “flexible interpretation”––implying that all definitions of a “thing,” an idea or a thought are in a constant flux. Can you elaborate this further? U5: If you take the emotions seriously, you can never feel like another person. But emotions come through and relate to other people. The colour conspiracies and associations are obvious, almost banal. They are based on socially embossed and learned perceptions, bodily functions. And yet they will trigger a different, specific memory in each one. Maybe they‘ll take you to a place you almost forgot. Regarding the flux: yes, we often take elements from earlier works bring them into a different form, so we also remember through and within the works. In “House of Sentiments” we have also incorporated references to works by other artists in the exhibition. For example, next to our installation the work “EINS. UN. ONE.” by Robert Filliou is shown. The piece consists of coloured dices that have only one eye on all six sides. We loved the dices and put them in the movie. We chose the dice as a symbol for yellow, “Happy.” In the film, the main actress wears a cloak of hot glue, scraps of which hang from the scaffolding of our sculpture in the next room. Right now we ask ourselves: how can we invite you further into the “House of Sentiments?” You are not there for the opening of the show, but via the webcams installed in the second room could you tag the emotions of the visitors? HR: I would love to join you on the webcam during the opening, which brings us to the second part of the installation. Could you describe what expects spectators there and how it is related to the first room? U5: It‘s a walk-in sculpture. 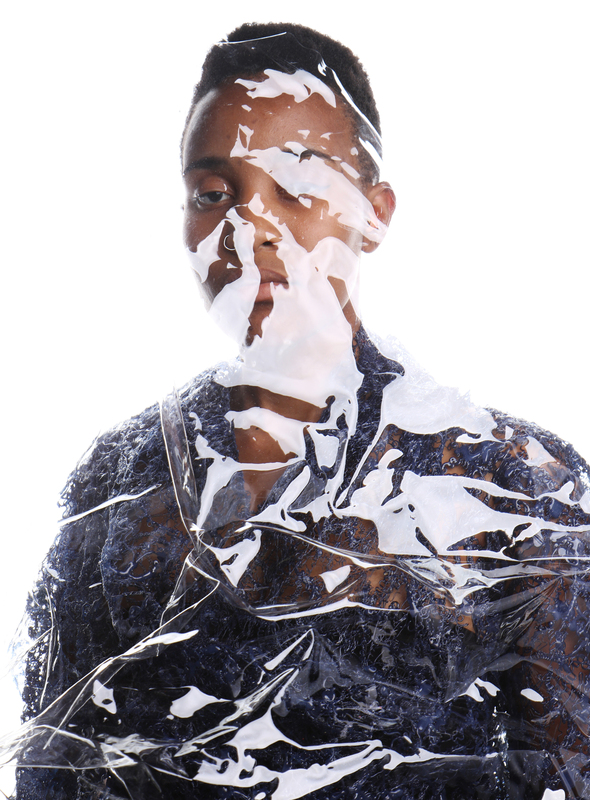 A scaffold made of water pipes covered with light, transparent fabric. Inside, flags hang from the scaffolding, 3 webcams are aimed at a seat in the middle of the 6-cornered sculpture and a monitor is hung on one side. 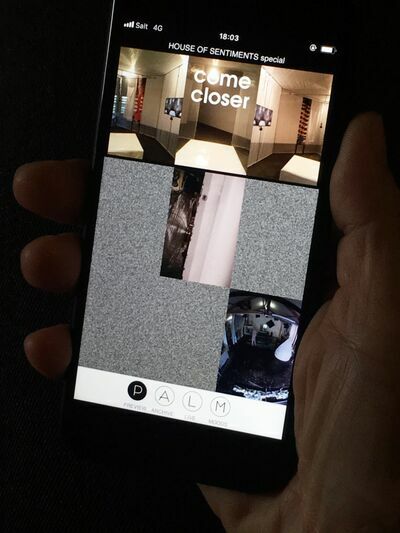 The visitor enters the room, is filmed from 3 sides and can look at the monitor a self-tryptichon. These pictures are streamed live on our PALM platform (https://palm.92u.ch/). Viewers from all over the world can imprint moods on these images. These are then displayed as subtitles and additionally change the colour of the pictures. 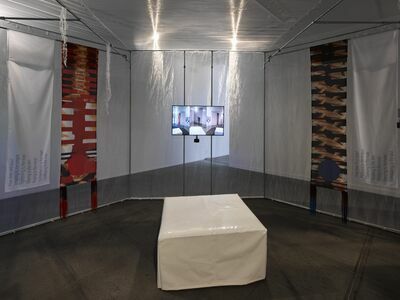 The connections to the video room are multi-layered: the colours red, blue, yellow and gray appear again, the flags carry texts that appear in the video, scraps of hot glue that the leading actress Khensani de Klerk wears in the video hang in the room. And here, too, visitors decide for themselves how much they are involved in the installation. The degree of involvement interests us in immersive works. How deep do you dive? How much do you allow to happen? How much time do you spend in the installation? “House of Sentiments” consists of the three elements: Building / Body / Brain. Building: the video room touches the museum building, uses its architecture and is limited by its conditions (acoustics, climatology, safety). Body: the sculpture stands as body free, almost autonomous in space. Brain: a dedicated internet-enabled device is needed and anyone can virtually enter and influence the museum from any location. U5: Yes, we have to leave out the smell at Kunstmuseum Bern. The museum was worried that it would be scattered throughout the house and that the “Cornelius Gurlitt pieces” and the Ferdinand Hodler‘s collection would start stinking. HR: Let’s imagine you could have kept your original plan, how would the installation be different? U5: Smell has the sudden power to recall situations, moments, people. For example, we know that when we enter a stairwell; you open a door: it smells like the house we know from childhood. Odour is remembered and remains anchored there. It has a tremendous power, although it is often perceived unconsciously. It is invisible and direct and disappears from perception if it has been for too long in one’s nose. 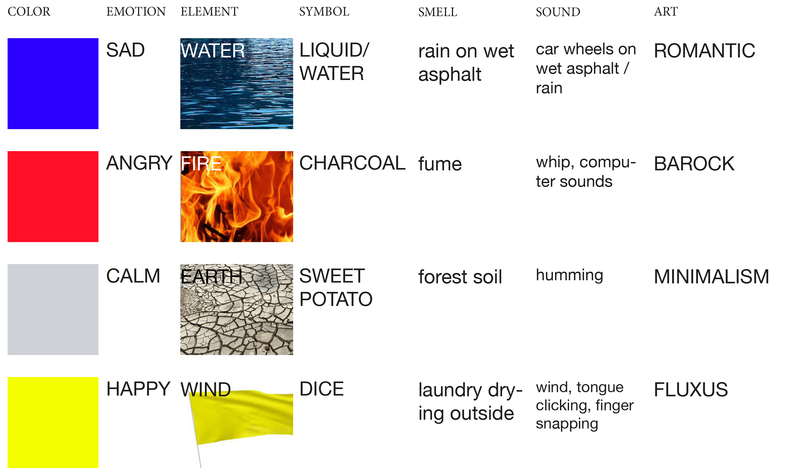 For “House of Sentiments” we have determined scents, such as summer rains on asphalt or forest floor, to the respective emotions. We already had a scent scene in our last film “The Human Crater,” a modern, mushy, ashy fragrance. However, most viewers do not perceive it as part of the work but think it is the scent of the room, some do not notice the fragrance. Nevertheless, the work is received differently than without. HR: Your work questions the influences of the digital worlds on our analogue realities. Do you see our lives more in the realm of physical reality, or is the digital part of our minds by now? Or in different words, what kind of hybrid do we live in? HR: Ok, you made a good point here. Then maybe we can talk about the hybrid chain of thoughts and sources of inspirations during your working process. While working on this installation you came across essays and historical events, Instagram posts and architectural politics. How did you make use of the found footage? U5: Sentiments, are emotions that are deposited as memories and thus make us a bit to what we are. When we are at work, the perception is controlled. You have something in focus and then everything can potentially serve something. It is collected in all directions and then what works in the process remains in the work. It sediments. HR: What do you think about the role of chance and arbitrariness, associations and randomness, repetition and citation? Maybe we can discuss it along an example, such as the constantly re-occurring eye-motif in your work? U5: When we formed the collective in 2006, one of our first and most important collaboration tools was to install a web cam in our shared studio. The “space-time-eye,” as we call it, gave us the opportunity to observe the dynamics of the collective from the outside. The PALM project, which we have been working on since then, shows how essential it is for us to observe. It is not clear who is watching and who is being watched. The webcams have become mobile. We always carry cameras with us. 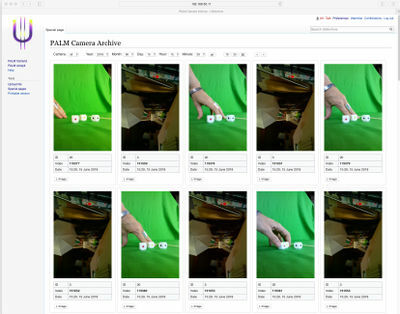 And stream these images live on the Internet, we redistribute these cameras to interested people and thus, open this platform to a broader public and try to build connections to other people. The eye appears often in the video works because there, you can look without shame really long in the iris of a person. The digital eyes that look in the black mirror are everywhere and the 1:1 moments from human to human are increasingly rare. If you look into the real mirror, there is something strange, almost uncanny, when you look at your own eye with your eyes. They say: “The Internet does not forget,” and what about our retina? Does everything stay stored there once we have seen? Can it be overwritten? And will it only be deleted when we close our eyes for the last time? HR: The exhibition at Kunstmuseum Bern addresses the value of collaborations and collective practice. When and why did you decide on working together? U5: We would like to ask this question the other way round. When does the solitary artist decide to work alone? That is not possible consistently. The artist always takes in the conditions and relationships of the world and processes them. The environment is always a shaped one, full of protagonists and stories. For the realisation of artworks one has always needed more than one person. Many artists work with big teams, but only one name is pushed into the outside world. Where does the different evaluation and hierarchisation of the work done come from when leads to an exhibition or a work? We are not concerned with anonymity, but with a pointed attitude towards the genius cult. Hannah Arendt once said that there is no single man, there is only man among men. HR: How do ideas come along and how are they realised in your collaborative artistic practice? Regarding your different backgrounds in architecture and visual arts, are there any tasks you divide between each other or is every single piece of a work done collaboratively? U5: We do not actively distinguish who does what. It‘s more like the one who can do it, does it. Sometimes we can do it all, then the one who starts it off and has the capacity works on it. Things are realised by being able to make the decisions that lead to the work. In our studio we have a work by Sonia Genoese. It‘s a painting with black writing on a white background saying “impossible is nothing, just do it.” She combines slogans from two competitors (Adidas / Nike) who work in the same field. That is actually quite good. It‘s not about perpetuating your own imagination, nor about making everything together at all costs. It‘s about the work and if something happens that is exciting; something that opens the eyes, then that is gratifying.